Snrky: Let me guess, within the hour, just like the other scripts? Let me guess, within the hour, just like the other scripts? I think the underlying story here is no one really appreciates what scripts can do until they see them in action solving an issue that previously they thought might take weeks and then you get asked to produce them by the novel-load with the expectation that every single one of them takes less than sixty minutes. I love Powershell. When I saw a practical demo at the local Code Camp (Twin Cities, shout out - I've worked with that smiling thumbs up guy in the video) I went home and gave it a spin to solve a permissions list request for TFS I was previously told I'd have to wait days for before I could hand it off to a security investigation. But I seldom let anyone know I'm competent in its application. I use it to solve my own problems efficiently without an imposed deadline. Title: Let me guess, within the hour, just like the other scripts? 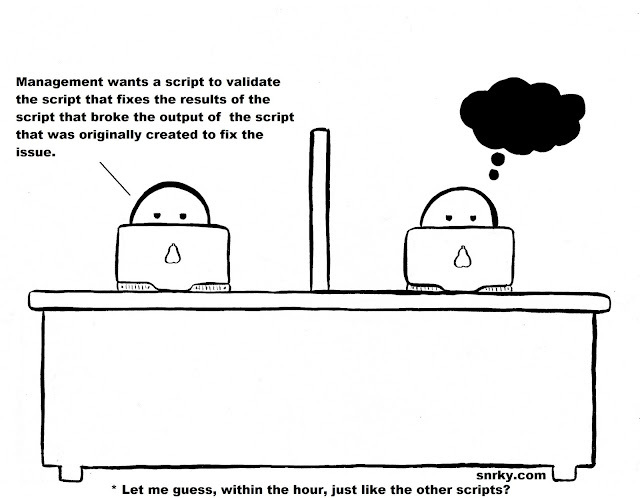 Snarky: Management wants a script to validate the script that fixes the results of the script that broke the output of the script that was originally created to fix the issue.